When the blustery winter weather turns our attention to things that can make us feel warm and cozy, what could be better than a hot toddy? Christopher O'Hara's visited The Saturday Early Show to share his recipes on the classic winter drinks. 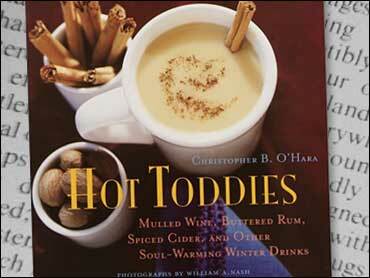 O'Hara's idea to write his book, "Hot Toddies," came from a friend. He says he started the project not realizing how much fun it would be. The author of "The Bloody Mary," "Ribs," and "The Ultimate Chili Book, " says hot toddies can make a small cocktail hour more special with only a little effort. He believes guests will love the drink as well as the gesture. The classic hot toddy is a mixture of boiling water, liquor and a lemon twist. For many years prior to over-the-counter cold remedies, the hot toddy was world-renowned for its curative effects. The liquor eased aches and distracted the sufferer from his woes while the hot liquid cleared congested sinuses. O'Hara believes that hot toddies can clear up a head cold faster than any cold medication. Hot toddies can be made with any brown liquor. Brandy is usually used but you can use scotch, bourbon or rye whiskey. O'Hara prefers Irish whiskey. You can make it festive by adding an ounce of cranberry juice to a make a cranberry toddy. Boil 3 quarts of water in a large pot. Place 1 ounce of liquor and 1 teaspoon of sugar into a mug and fill to the top with boiling water. Twist a lemon peel above the liquid and drop it in. This hot toddy has German roots. O'Hara writes in his book that very few people take Christmas as seriously as the Germans, who gave us the Christmas tree, the advent calendar and the carol, "Silent Night." But, they also gave us fruitcake. However, they have redeemed themselves with Grandmother's punch which is a traditional drink served at midnight on Christmas Eve. It is rich, smooth and strong. In a large pot, combine the sugar, spices and vanilla beans with 4 cups of water. Bring to a boil and cook over high heat, stirring frequently about 5 minutes or until half the liquid has evaporated and the remainder is syrupy. Remove from the heat, stir in the tea and allow to steep for about 10 minutes. Strain the mixture through a fine-mesh sieve into another large pot and stir in the red wine and rum. Warm over medium heat until steaming about 7 minutes. Serve warm, garnishing each glass with a cinnamon stick stirrer or serve chilled over ice. Modern-day witches, known as Wiccans, celebrate a winter solstice festival called Yule right around December 21st.. According to their Book of Shadows, this is the appropriate tea to drink while celebrating an authentic Yule. There's no alcohol in this one. Stud the lemon peel with the cloves and place in a square of cheesecloth along with the remaining spices and chamomile. Tie the sachet using kitchen string and place in a large pot or teapot along with the tea bags. Bring 6 cups of water to a rolling boil in a separate pot and pour over the sachet and tea bags. Allow to steep for at least 3 minutes, then serve the tea in mugs with the apple slices floating on top. This recipe is an easy way to liven up traditional hot chocolate. Making the Cocoa: In a heavy saucepan, combine 1/2 cup of water with the cocoa powder, sugar, vanilla and salt over low heat. Whisking frequently, cook until the mixture is smooth. In a separate pot, combine the milk and cream and heat until just boiling. Gradually whisk the hot milk into the chocolate paste until completely blended. Keep warm. Making the Peppermint Whipped Cream: Place four candy canes into a doubled plastic bag and pound with a rolling pin until finely pulverized. In a medium bowl, whip the cream to soft peaks, then fold in the peppermint pieces. To serve, pour an ounce of creme de menthe into a mug and top off with hot cocoa. Stir, then garnish with the peppermint whipped cream and a candy cane stirrer. Coquito is the Puerto Rican version of the classic eggnog. This Caribbean treat blends luscious coconut milk with rum to create an eggnog that will have you yearning to replace that Christmas turkey with a roast pig. In a large saucepan, warm the coconut milk until steaming, then stir in the sugar until it dissolves. In a large bowl, beat the egg yolks and vanilla until thick and smooth, about 3 minutes. Stir in the rum and then slowly add the batter to the steaming coconut milk, stirring constantly. Be careful never to let the mixture boil or it will curdle. When completely mixed, remove from the heat and let cool. Place in a sealed container in the refrigerator until cold. Serve with cinnamon sprinkled on top.